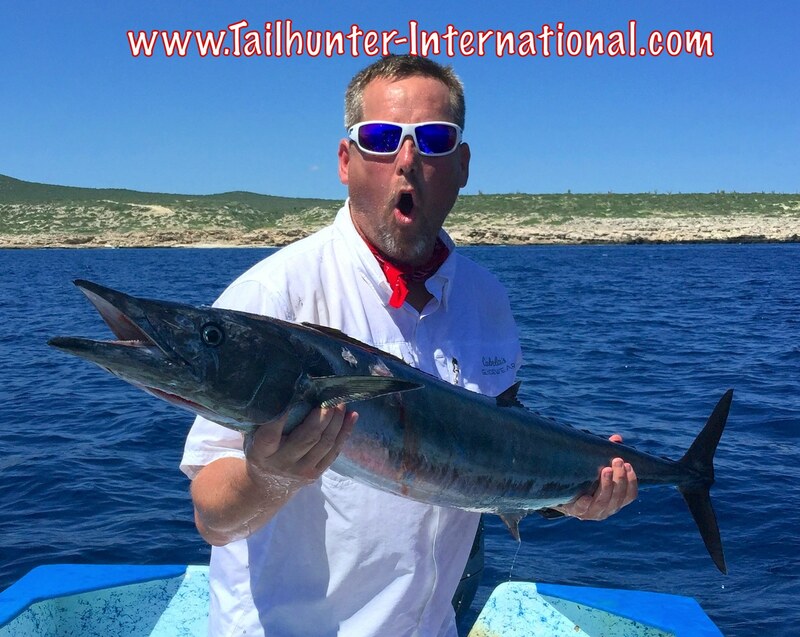 Shane Summerhays from Utah has the great face on for this picture almost like he’s saying “WAHOO!” which is exactly what he’s got in hand with a nice fish he took just off the rocks near Punta Perrico. He actually hooked two wahoo that day. Good way to start the trip for our Montana amigos, Sharon and John Virgin from Montana with Captain Jorge on the beach at Muertos with 4 of their 7 dorado. Some of the nicer-sized dorado for the week! Nice to see they’re getting a big bigger! We get some of our nicest folks from Utah and we were happy to welcome two of our newest Utah friends, Keith and Brenda Sargent. 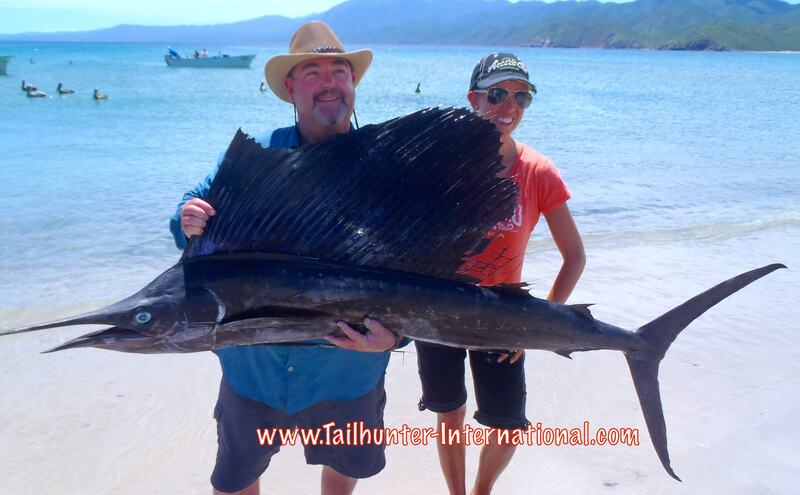 They had a double-hook up on sailfish with both of them pulling on fish at the same time! The majority of the meat was donated to the pueblo. Amigo Carl Lange from Bakersfield CA put the wood to this much-prized good eating barred pargo. The trophy-sized fish is tough to get out’ve the rocks! 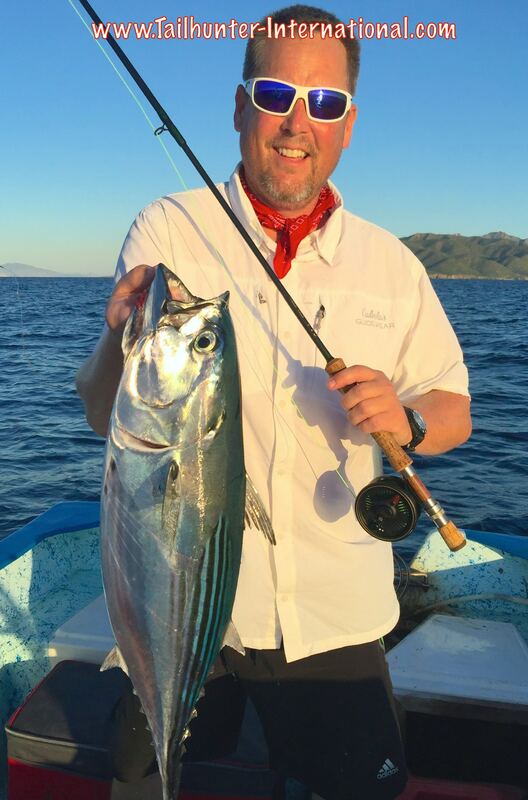 Check out the size of the bonito Captain Raul is holding for Trudy Grove, another of our fun Utah folk. While not especially good eating, the big members of the tuna family have been beating up on our anglers fishing out’ve La Paz Bay. He’s been fishing with us since he was 9 and now he’s all graduated from college and living in Arizona. Aaron Hasson knows how to fish too! 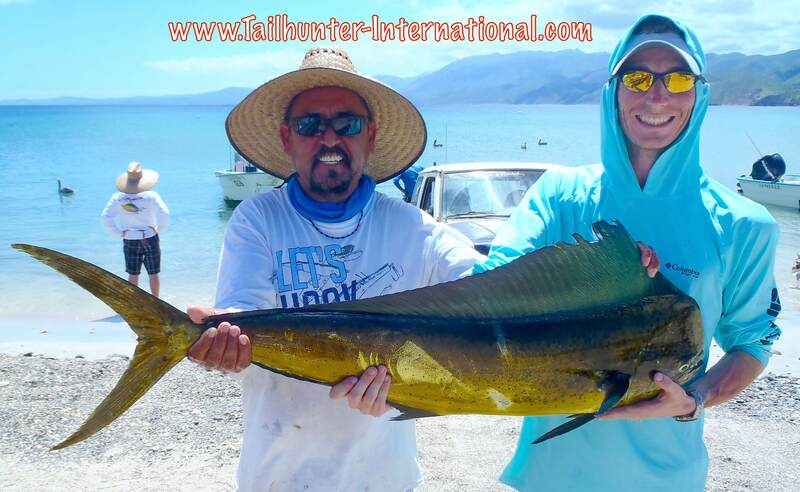 He’s with one of the bigger bull dorado of the week and poses with Captain Jorge. I have an affinity for goofy fishing photos like Rick Connell standing in the warm clear waters of Balandra with a couple of his dorado mugging for the camera. Thanks, Rick! 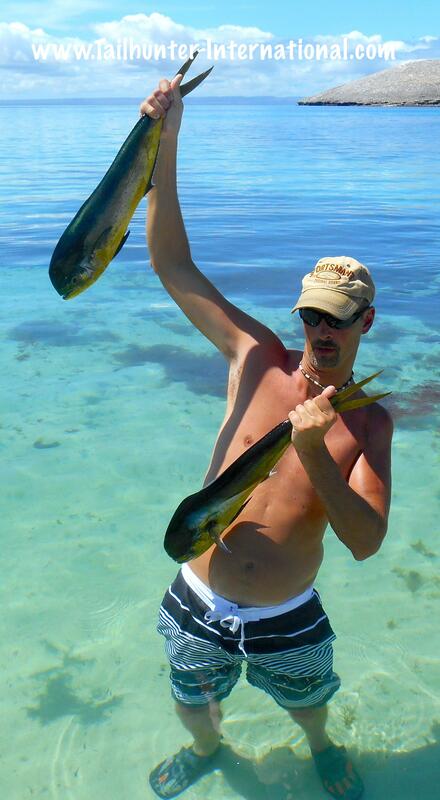 He took some time to pull out the flyrod and had some fun with dorado and bonito! Shane Summerhays got pulled around by this tough bonito while fishing near Punta Arenas with us. There’s a reason, the Mexican name for jack crevalle is “TORO.” It means “BULL” and when you get a jack crevalle on your line, it’s a tough fighter. Carl Lange shows off a sturdy guy. Great fighter but poor eating so they get released . 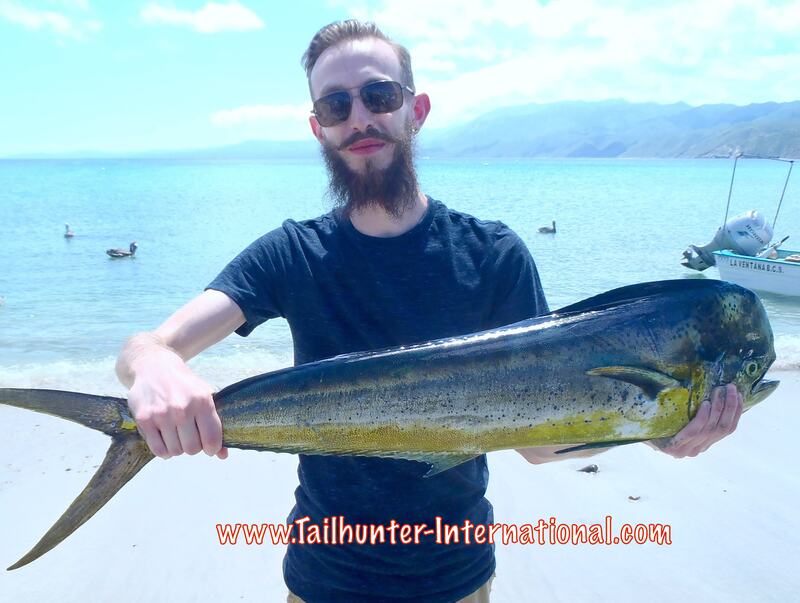 First timer with us from Oregon, Josh Swanson, got the better of this nice bull dorado posing on the beach at Muertos. He took this guy on live bait. It’s not just the first fish she’s ever caught…it’s the first fish she’s ever held! Ewwwww! Good sport, Shawna Blackburn with her first one! Whoa! 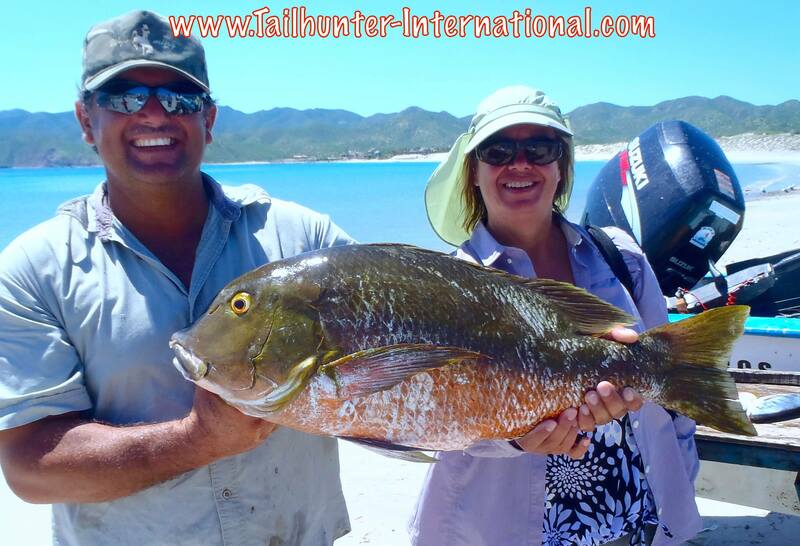 Big barred pargo and an assist from Captain Armando for Kathy Vande Vender who caught this not far outside of Bahia de los Muertos. Great eating! 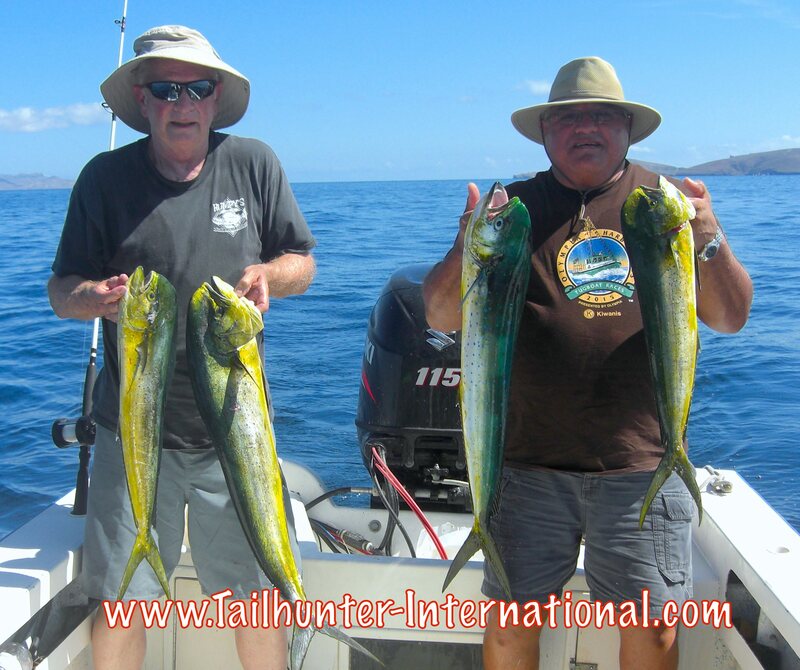 Our two new amigos from Washington, Clarence Cooper and John Sanchez with some of their dorado caught just inside of La Paz Bay. The bay can be pretty thick with dorado some days! 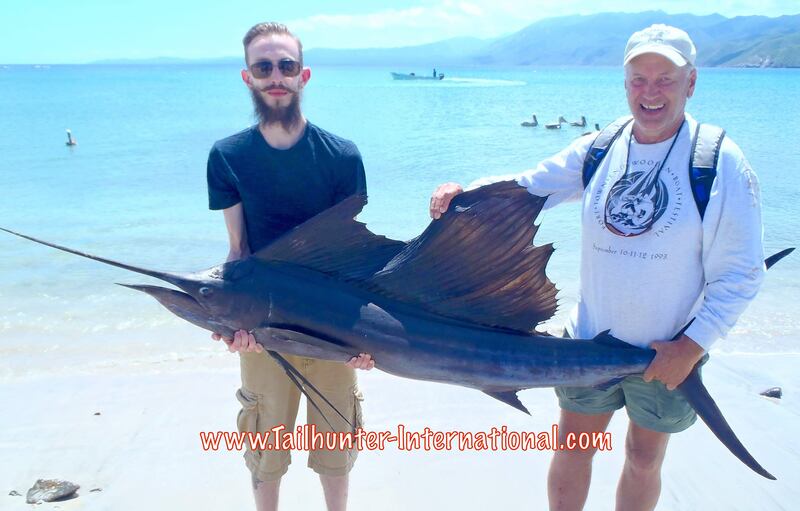 Dave Enge from Oregon brought his grandson, Joshua, down for a week of fishing and was rewarded with a nice sailfish their 2nd day out. They donated much of the meat when the fish could not be released. 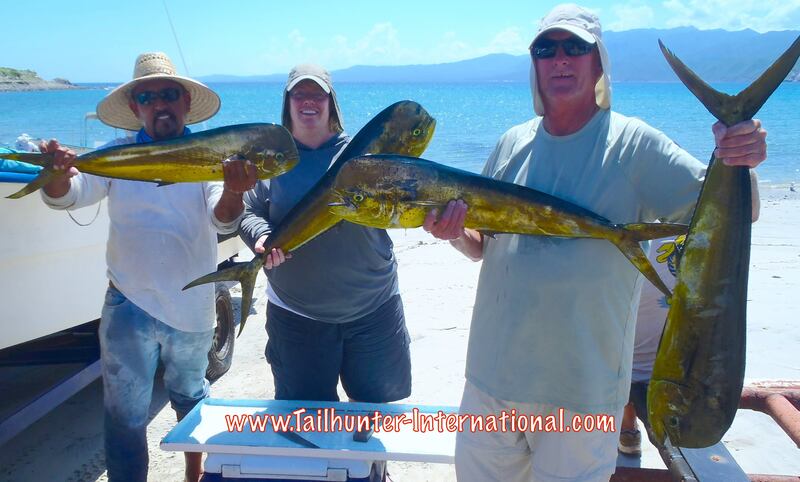 They also had a good week on dorado and other species as well. You gotta love it! 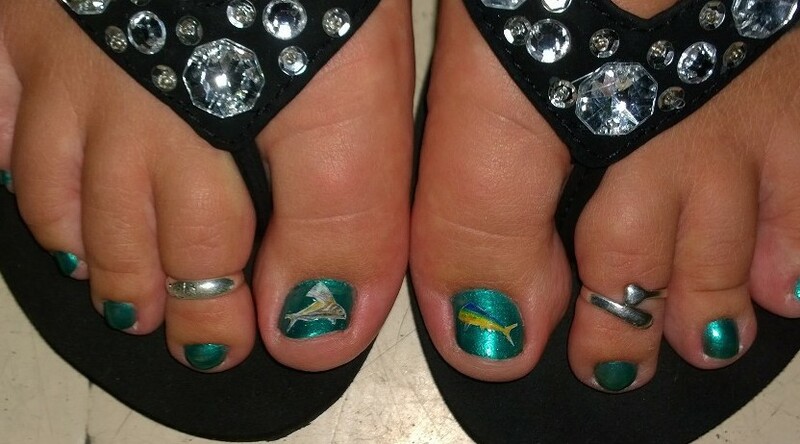 Trudy Grove got her toes all dolled-up in style for her La Paz trip with a roosterfish and a dorado! NUTTY WEEK OF FISHING – SUPER MOON – ECLIPSE – GREAT WEATHER – WHAT A MIX! 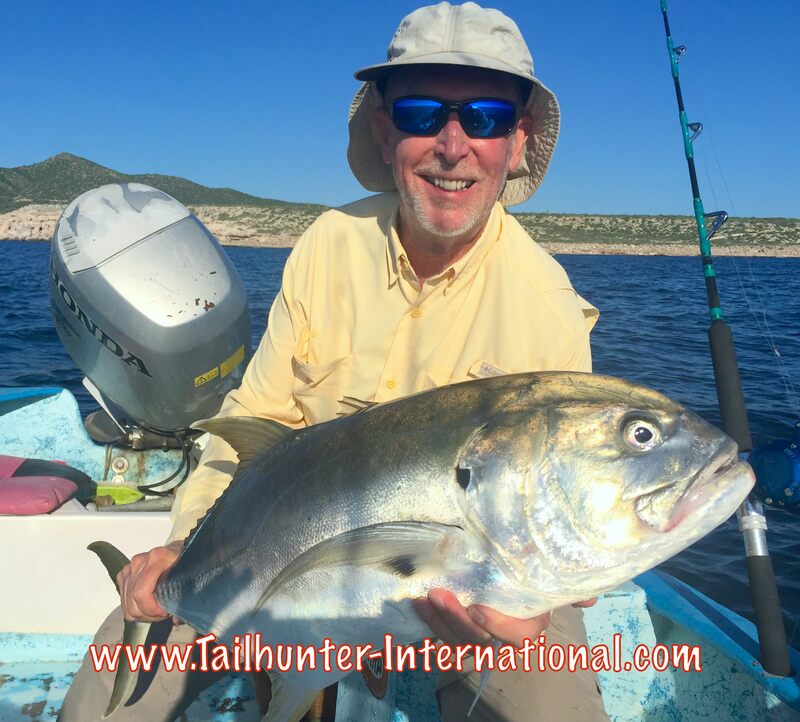 It was a mixed week of fishing and difficult to pinpoint why some fisher folks did well one day and poorly the next or why Las Arenas would be better than La Paz then the next day La Paz would be better than Las Arenas. It was really the luck of the draw. Same with the weather. 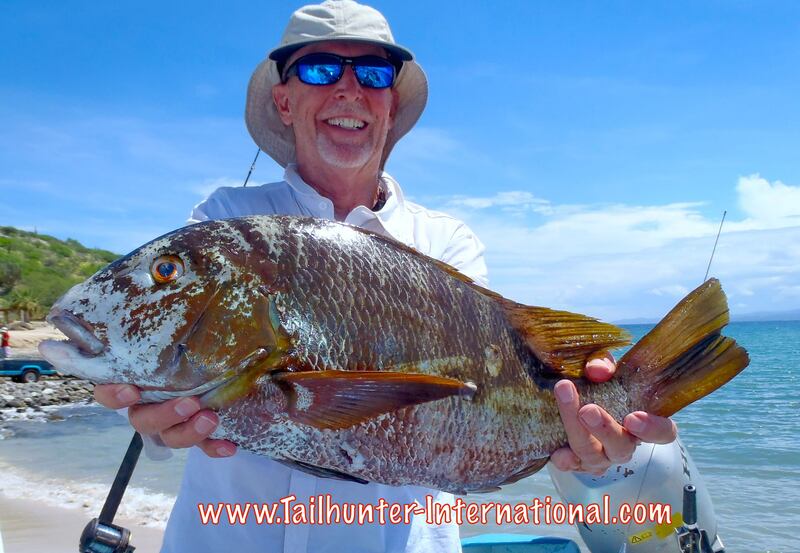 Early in the week, the weather was quite tropical with lots of humidity and always the chance or rain and wind interrupting the day or putting a damper on the fishing. As the week went on, the weather got to be incredible with some of the prettiest days in weeks, but the fishing seemed to diminish somewhat. One day good. Next day so-so. One boat goes crazy and next boat struggles to get one fish. I’m not a big believer in the full moon thing and how it adversely affects fishing unless a number of other factors are involved. However, as the week went on, it got closer to the “super full moon” (larger and closer than normal) combined with an eclipse. Water levels were much higher and lower than normal plus currents and tides were higher and lower than normal. Could have been the reason for the hot/cold fishing. But, it was really a matter of luck with the fishing. One day, we’d get marlin and sailfish, dorado, pargo, cabrilla and roosters as well as other species. All our clients would want to fish there the next day. That next day…it was like someone turned off the spigot. Guys would work hard to get 2 or 3 fish. Some skunked. No real change in conditions. Just the fish changed their attitudes. The following day, the fish would blow up great again. One note…more billfish and larger dorado on this side (still not saying much since a “big dorado this year is 12 pounds), but a few weeks ago, all the dorado were less than 5 pounds! There were a few off-days or off-boats. However, overall, if you wanted to put fish in the cooler and get bent, this was the side to fish. The fish are not big. They are tiny by our standards. The “small fish” this time of year should be 15-20 pounds. This year, most of the fish are under 10 pounds. But, there’s alot of them. And they are close…literally you can find fish right in La Paz Bay. In front of the Pemex station north of the city, only minutes from the city, there’s been a big tanker sitting out there that’s holding all kinds of dorado. About a mile out of Balandra again, there’s another big spot of dorado. 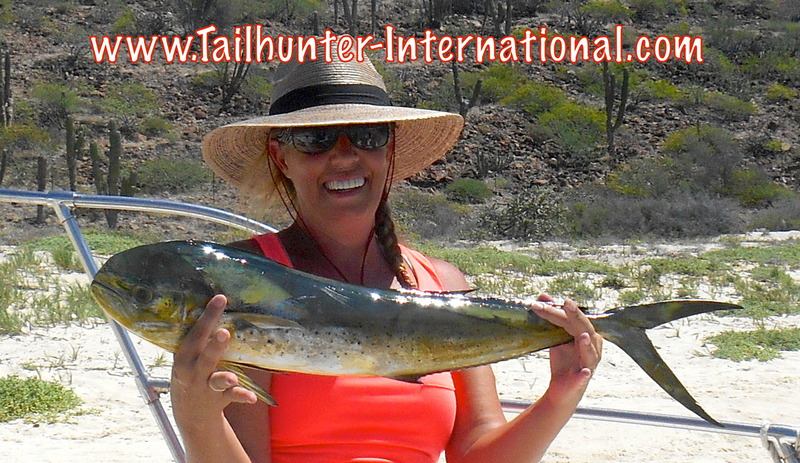 Some days, all the small dorado you can catch-and-release. We had some boats this week get 20-30 fish releasing most of them. The folks fishing light tackle are having a blast. I know, it’s crazy, we don’t have any other options. By the way, the new road from Cabo should be opening up any day now which would mean the travel from Cabo to La Paz will now only be about 1 hour 40 minutes intead of 3 1/2 hours! These two have been Tailhunter family members for years. Aaron Hasson started fishing with us when he was about 9 -years-old and his dad, Al was bringing him down. The two hauled down a full load of school supplies, sports equipment and bags of clothes for our charities! 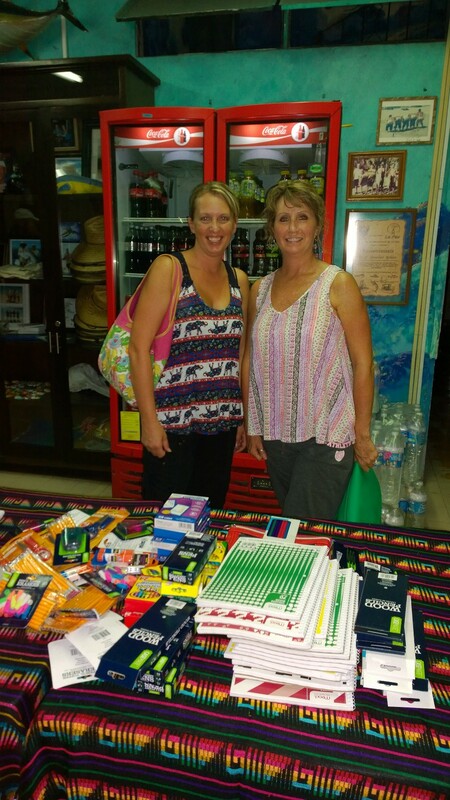 Best amigas, Trudy Grove and Kathy Terbu and their respective families packed up a bunch of great supplies for our kids! Thanks, ladies! Muchas gracias for the big hearts! 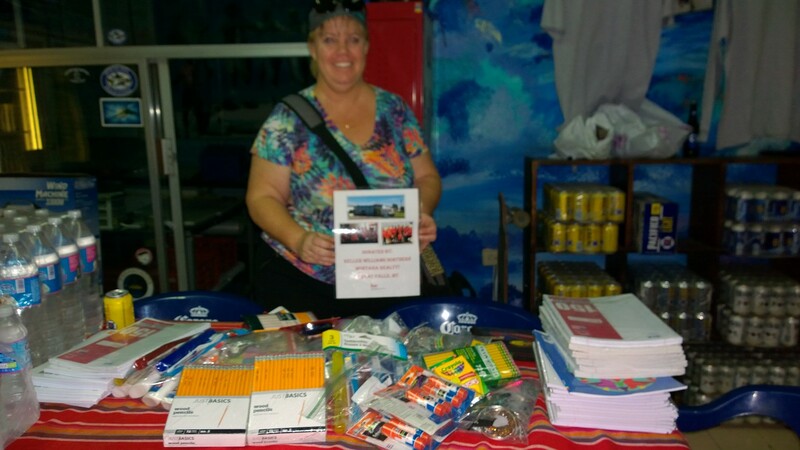 Sharon Virgin and her team at Keller Williams Realty in Great Falls MT put together all kinds of good stuff that’s going to the underprivileged kids as well as some great stuff for the ladies at the battered womens’ shelter here in La Paz. Muchas gracias more than you know! 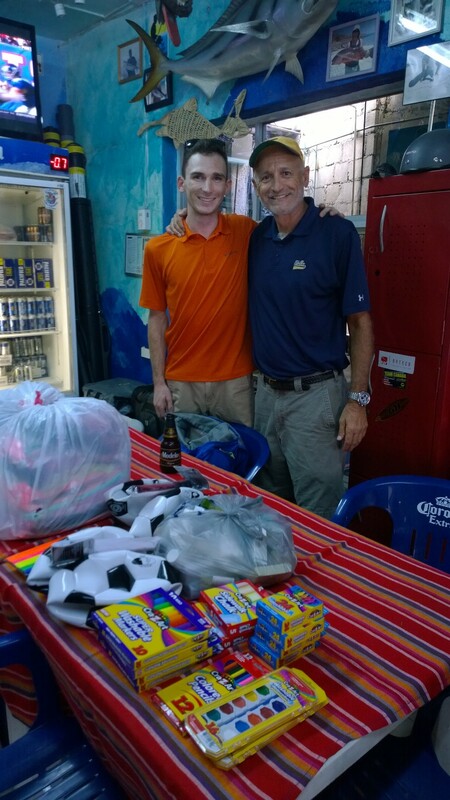 Thanks to all our friends this week who found a little extra space in their luggage to bring down much needed school supplies in our “PACK FOR A PURPOSE” program to help underprivileged school kids, orphanages and the battered women’s shelter in La Paz! You all rock. Thanks for the big generous hearts!